This is the submenu window of framework. For a description of the menus please scroll down. If you want some tution to be located at some specific places in the timetable you can do this using stipulations. This menu will allow you to delete the stipulations. This menu will check the contradictory entries which should be removed before performing the calculation. 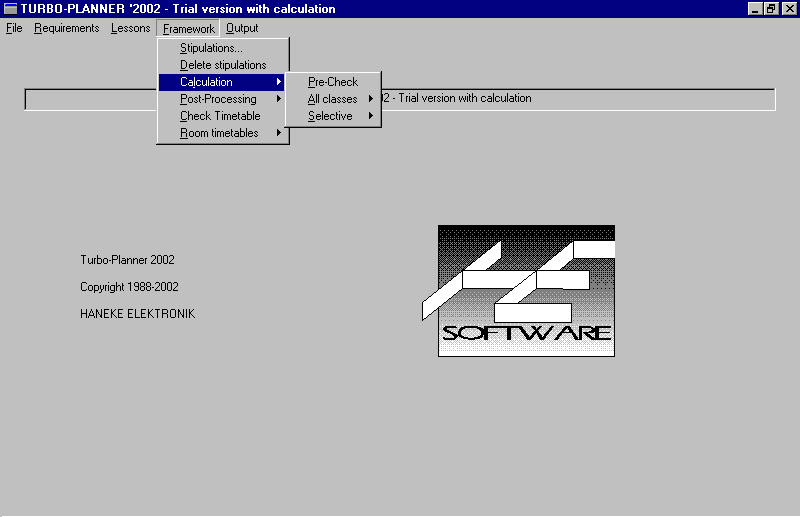 This menu is used to start the new calculation. Here you can calculate the timetable of those teachers & classes which have special timetabling problems. This menu displays different windows. It displays room allocations window, teacher timetable of each class & the error list which can be updated if you modify the timetable in the editing windows. Here you can change various settings & can perform moving operations. This menu lists the errors in the timetable. You can modify the table if desired from this menu. Here you can recalculate the room allocations. It also displays room editor.